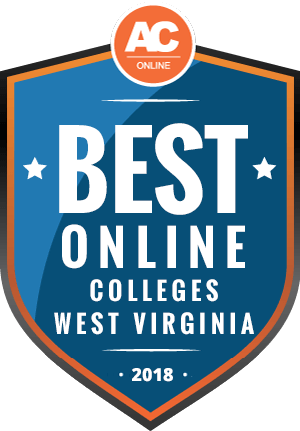 Why Choose West Virginia for Online Higher Education? According to the U.S. Census Bureau, more than 85% of West Virginia’s residents age 25 or older completed at least a high school education. However, less than 20% of West Virginia residents hold a bachelor’s degree or higher. By 2020, 55% of jobs in West Virginia are projected to require a postsecondary education. For that reason, West Virginia residents should pursue higher education degrees to meet the state’s future employment needs. Online colleges in West Virginia offer students and working professionals convenient, flexible courses and programs. These colleges provide learners with opportunities for personal and career advancement, and allow students with prior college coursework to transfer those credits. Online colleges in West Virginia create affordable options for continued learning, which is ideal for both in-state and out-of-state students. Colleges and universities in West Virginia offer almost 50 academic programs completely online. This allows single parents, working professionals, and students with restricted schedules to earn their degrees at a pace that works for them. Full-time workers who want to advance their current positions can study while maintaining their professional commitments. Online options in West Virginia cater to the needs of undergraduate, graduate, and international students alike, providing them with access to programs at various educational levels. In-state students in West Virginia pay lower tuition than their out-of-state counterparts. To qualify for in-state status, learners must have at least one parent living in West Virginia for at least one year before entering an academic program. Independent students must reside in West Virginia for one year before they can begin their studies. Online students pay in-state or out-of-state tuition based on their state of residency, but some learners residing in neighboring states may qualify for reduced tuition through reciprocity agreements. Students can also appeal to change their residency status if their primary purpose for living in West Virginia is not to attend college or university. Tuition at many colleges and universities in West Virginia costs more than the national average, but exact numbers vary between public and private institutions. Tuition for online learners in West Virginia varies significantly based on academic program and school. Many schools charge the same tuition for in-state and out-of-state students, and some offer flat-rate tuition. West Virginia University, a public, four-year institution, offers online degrees with tuition ranging from $396-$1,095 per credit hour. Davis & Elkins offers one online program, an RN-to-BSN degree, with a flat per-credit hour tuition rate of $400. Nonresident students in West Virginia may receive reduced tuition through reciprocity agreements or metro-rate reductions. Online students at West Virginia colleges and universities enjoy accredited programs recognized by institutions around the country. Online degrees in subjects such as nursing prepare students to obtain licensure, the requirements for which often vary between states. This factor can influence where a learner completes his or her degree. Four regional interstate compacts for higher education in the United States provide learners with opportunities for collaboration and college affordability. As part of the Southern Regional Education (SRE) Board, many West Virginia colleges and universities participate in the Academic Common Market (ACM). The ACM offers in-state tuition reciprocity for certain programs at West Virginia schools. To qualify, learners must reside in one of the 15 SRE states and enroll in an approved program. West Virginia University also maintains a reciprocity agreement with the state of Ohio for students who meet specific criteria. Colleges and universities in West Virginia that participate in the ACM hold accreditation through the Higher Education Policy Commission. Reciprocity agreements within the ACM fall under the regulations by the National Council for State Authorization Reciprocity Agreements (NC-SARA). According to NC-SARA, participating institutions must hold accreditation through an agency recognized by the U.S. Department of Education. States and individual institutions choose to join NC-SARA, and participating schools do not have to accept transfer credits from other participating institutions. Tuition rates are ultimately program and institution based. Ask someone from a prospective program about what rates would apply to you, specifically. The most affordable online colleges in West Virginia offer convenient, quality courses and degrees to learners in undergraduate and graduate programs. Minimum inclusion requirements for four-year institutions mandate annual tuition under $25,000; for two-year schools, tuition must fall below $5,000 annually. Schools must offer learners at least three associate programs and three master’s or bachelor’s degrees online, as well. High-ranking institutions on our list offer strong faculty-to-student ratios, high graduation rates, solid career services, and an array of financial aid options. Located in historic Charleston, the University of Charleston is a private institution known for its small class sizes, with an average class ratio of 14 students to each instructor. The school offers close to 40 undergraduate and graduate programs through their School of Arts and Science, School of Health Sciences, School of Pharmacy, and School of Business and Leadership. Distance learning options are offered either completely online or through a blended format, and include six bachelor’s, three master’s and one doctoral degree. Online assignments and communication are handled through eLearn, an online course management system. Qualifying distance learners are eligible for financial aid, and military and first responders can receive reduced credit fees. West Virginia University is a public university that places a strong focus on research and offers over 340 programs across its varied campuses. In addition its extensive list of on-campus offerings, the school also offers more than 30 degrees, eight certificates and some three hundred individual courses online. Non-traditional learners can take advantage of the Regents Bachelor of Arts (RBA) degree, which allows students to earn credit for military, work and/or life experience, in addition to College Equivalent Credits (CECs) for academic experience earned at other schools. All of the school’s online bachelor’s degrees can be finished completely online, but some of the graduate degree programs require partial attendance on campus. West Virginia University is accredited by the Higher Learning Commission, with many of its programs also holding specialized accreditation. Founded in 1827, Marshall University is West Virginia's oldest public postsecondary school. Located in downtown Huntington, Marshall University offers more than 100 programs at all levels, from certificate to doctoral degree. The school also has robust distance learning options, which includes an undergraduate certificate program, four online bachelor’s degrees, ten online graduate degrees and nine graduate certificates. All distance degree programs are offered completely online at discounted tuition rates. Online students have full access to various support services, such as academic advising, career services, libraries and the writing center, in addition to IT services if they experience any problems with the distance learning program. Located in Athens, Concord University is a liberal arts school offering a variety of undergraduate and graduate degrees. Noted as a “cost conscious” school, Concord University has the lowest average student loan debt of all four-year public institutions in West Virginia. Most of the degrees offered are at the undergraduate level, in various fields such as education, social work, psychology and studio art. But the university also offers four master’s degrees in the areas of health, education and social work. Students in need of additional financial help may be eligible for Concord’s Bonner Program, which awards scholarships to 80 students each year. Founded in 1865, Fairmont State University spans across 120 acres and offers more than 80 degree programs for more than 4,000 students at its West Virginia campus. The average class size is 22 students to each professor. Online degrees are mostly offered at the graduate level, but individual online courses are also offered, which can be beneficial for degree seekers who can’t attend regular on-campus courses. The majority of distance education classes are taught online using the course management system Blackboard, but some courses may require students to visit campus up to three times each semester. Adults interested in pursuing military careers can enroll in the university's Air Force ROTC or the Army ROTC. Bluefield State College offers a range of career-oriented degree programs at its main campus in Bluefield, and at its smaller campus at the Erma Byrd Higher Education Center in Beaver. More than sixty percent of Bluefield graduates earn degrees in STEM fields. Degrees are awarded in five disciplines: arts and sciences, business, education, engineering technology and computer science, and nursing and allied health. Bluefield aims to work with students’ busy schedules by offering many of their courses fully or partially online, with some hybrid courses including live-streamed lectures and in-class participation. Students on campus can also take advantage of student clubs - honors societies, service groups and Greek organizations - and academic support resources such as research labs and internships. When researching online colleges and universities in West Virginia, learners should take several factors into consideration, including cost, tuition, admissions requirements, and start dates. Read on for answers to common questions from prospective students. Do Online Credits Cost More or Less in West Virginia? Online tuition at colleges and universities in West Virginia compares to that at other schools around the country, but online credit costs vary by school and program. Many schools offer online programs with tuition rates comparable to on-campus and out-of-state programs. Online credits may cost less in West Virginia at institutions that charge flat-rate tuition. Davis & Elkins, for example, offers an online RN-to-BSN degree with a flat $400 per credit hour tuition rate for both in-state and out-of-state students. The University of Charleston (UC) charges a $380 per credit hour tuition for all of its online undergraduate programs. UC’s graduate programs charge a flat-rate tuition of $425, and its master’s and doctoral programs charge a flat-rate $700 tuition. In contrast, an on-campus master’s of business administration from UC costs students $25,000, which works out to over $780 per credit hour. Which West Virginia Schools Accept the Most Transfer Credits? Colleges and universities in West Virginia maintain several transfer and articulation agreements. Four-year schools like West Virginia University and West Virginia University Institute of Technology hold agreements with two-year schools, which apply to students who want to transfer to a bachelor’s program after completing the initial credit hour requirements. This allows associate graduates to transfer 60 credit hours toward a bachelor’s degree in their discipline. As more schools enter into transfer and articulation agreements, students may benefit from easier access to bachelor’s degree options. Most colleges and universities cap transfer credit hours at 60. Schools in West Virginia have agreed to transfer general education coursework, though each individual school must assess courses and syllabi. If your school declines your request to transfer prior credits, you can appeal the decision to the West Virginia Higher Education Policy Commission, if necessary. Transfer students can assess their eligibility for transfer equivalencies using tools like WVU’s transfer equivalency self-service. Fairmont State offers an extensive list of courses and course titles that may transfer between schools in the state. Will Any Online Colleges in West Virginia Accept a GED? Colleges and universities in West Virginia, including West Liberty University and West Virginia State, accept GEDs with the appropriate documentation. Applicants with their GED must still complete an ACT or SAT. Students who earn their GED in the state of West Virginia can take the Test Assessing Secondary Completion, or TASC, to demonstrate high school-level educational competencies. The TASC credential is accepted by 97% of colleges and universities in the country. Students who take the TASC should submit scores to their potential institutions. Many schools impose TASC score requirements — WVU, for example, requires students to score at least 2250 (450) for admission. Students who score below such requirements may still obtain conditional or provisional admission. Two-year schools in West Virginia also accept GED and TASC credentials. Students should request to send official scores to potential schools. How Many Academic Terms per Year Do Online Colleges in West Virginia Offer? Online programs at WVU and many other public institutions in West Virginia offer online programs that coincide with on-campus semesters and academic years. With classes that correspond to on-campus schedules, full-time students complete their degrees along traditional two- and four-year timelines. WVU also offers three-week online classes over a winter intersession, providing learners with accelerated coursework for quicker degree completion. Students can only take three credit hours during a winter intersession. Schools like American Public University offer certain courses multiple times during each academic year, with classes lasting either eight or 16 weeks. This increased number of course offerings creates a higher level flexibility for students. West Virginia also offers online classes through WVROCKS, an online service that provides eight-week, asynchronous coursework to learners. Classes through WVROCKS count toward programs at participating institutions, particularly Board of Governors and Regents of Arts degrees. Which Online Colleges Will Accept FAFSA in West Virginia? All online colleges and universities in West Virginia accept the Free Application for Federal Student Aid (FAFSA) and encourage applicants to submit the form when they submit their college applications. Some U.S. schools, called “no loan” schools, choose not to use the FAFSA, but the vast majority of students in West Virginia benefit from the grant, loan, and scholarship opportunities afforded by the FAFSA. FAFSA aid may apply differently to online programs in West Virginia, depending on accreditation status. If your school or program does not hold the proper accreditation, your financial aid may not apply. Make sure to check your prospective school’s accreditation status. In addition to the FAFSA, students may apply for the College Scholarship Service (CSS). The CSS collects information from over 400 institutions about scholarships and nonfinancial aid. Learners can check the CSS website for eligible schools and programs in anticipation of applying for fee waivers and scholarships. Are There Any Free Online Classes I Can Take From West Virginia Colleges? West Virginia University offers free online classes through Class Central. Class Central includes access to Coursera classes including data science, account management, and sales force management. Courses last 4-5 weeks, but do not count toward a degree. Additional free online classes through the West Virginia Department of Education allow high school students to complete coursework through the Virtual School. The Virtual School gives high school learners opportunities to complete coursework not offered at their high schools. How Can I Find the Online Program Options at West Virginia’s Colleges? West Virginia offers online classes through WVROCKS, a program that facilitates the completion of Board of Governors and Regent of Arts degrees. WVROCKS provides asynchronous coursework in a collaboration with West Virginia universities and colleges and the Higher Education Policy Commission. As part of the West Virginia Network, or WVNET, WVROCKS opens educational opportunities to distance learners. Students can complete one course at a time, or take multiple classes, most of which are available entirely online. Limited face-to-face or interactive activities may be required. When looking for other online degree options, you can visit individual schools’ websites to see what they offer for distance learners. Each individual programs may offer some online coursework, or fully online degrees. Students in West Virginia benefit from federal, state, and institutional financial aid options. Federal loans and grants, such as the Pell Grant, provide excellent options for students seeking financial aid. Many states offer financial programs to assist first-generation students, adult learners, or underrepresented groups. Students pursuing a degree in West Virginia can apply for several grants that provide support to both residents and nonresidents. The HEAPS Grant Program supports students in West Virginia as they pursue certificate, associate, and bachelor’s degrees on a part-time basis. Students must demonstrate financial need and enroll in an approved institution. Applicants must reside in West Virginia. The West Virginia Higher Education Grant provides need-based assistance to West Virginia students. Students pursuing postsecondary degrees must demonstrate academic promise, maintain West Virginia residency, and not hold a previous bachelor’s degree. Students can apply funds to an approved program at an institution in West Virginia or Pennsylvania. Open to students attending any institution in West Virginia, the Cavalier-Nichols prefers to award funds to students enrolled at West Virginia University Institute of Technology. Students with an ACT score of 25 or higher and a minimum GPA of 3.5 can apply for this renewable grant. The Advanced Technical Solutions Grant, provided through The Greater Kanawha Valley Foundation, offers financial assistance to students pursuing information technology degrees. Students must maintain a GPA of 3.0 or above. Students studying computer science, information systems, networking, or programming may receive preference. West Virginia students from Kanawha, Boone, Clay, Putnam, Lincoln, or Fayette Counties can apply for the R. Ray Singleton Scholarship, which is offered through The Greater Kanawha Valley Foundation. Students must demonstrate academic excellence and financial need. Applicants can enroll in undergraduate or graduate programs.